Our first ever Cocktails for a Cure was so great! Thanks to everyone who came. We raised over $3000 for for the Melanoma Research Foundation and we are on our way to $10,000 by the end of 2011. My favorite part of the night was honoring Darren Farwell , my high school friend who lost his battle at age 32 to melanoma. Darren’s friend Devin helped me we give away some protective sunware items from UVSkinz.com – a company that Darren’s wife started after he died. My other favorite part was when my 9 year old daughter stood in front of 50 people and told them to “check their buttocks” for melanoma. It was hysterical, but so true! And we ended up winning one of the raffle prizes – one week at a Florida condo – it wasnt rigged, I swear! All in all, it was so nice to see everyone and I hope more people will come to my next one – especially others with melanoma who live around the area. 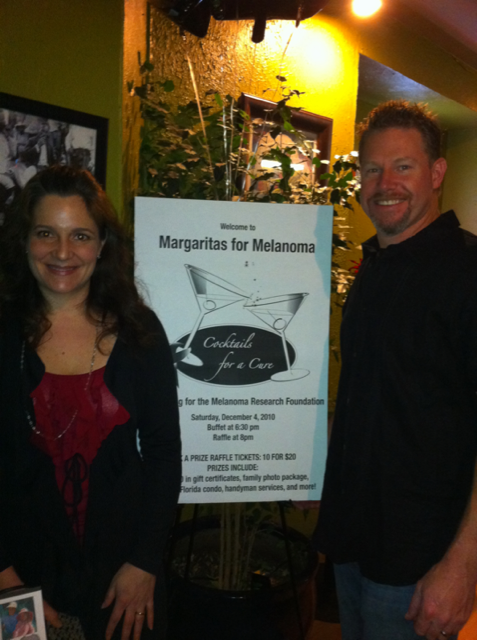 Margaritas for Melanoma is just the beginnning for us. Our next event will be in the Spring so stay tuned! This entry was posted on December 11, 2010 by emandmichael. It was filed under Melanoma . This is such good work. may need a bit of editing but the idea is right on! So are you guys.Carry On! That is so awesome, Emily!! Thanks so much for what you are doing!! Take care! Great work Emily and Michael!!! Although the I am sure you would rather NOT have a reason to do an event, you have chosen to not ‘sit on your buttocks’ and do nothing. You are making a difference and getting the word out about a disease that can so easily be prevented. Thank you for your efforts. I was just thinking about you guys. Congratulations on your event being a success. Hope Mike is doing well. Have a great Christmas and a healthy New Year. Pingback: Cocktails For A Cure « Live In Our Skinz! What a great event – I wish I was local so I could have joined you! Pingback: Cocktails For A Cure | Live In Our Skinz!